Railway Recruitment Cell of Eastern Region (RRCER), Kolkata, West Bengal has completed the OMR Based Written Examination for recruitment of Group D Staff in the Eastern Section of Indian Railway. To know about Result/Recruitment Information please read this post. The examination was held on the various dates across West Bengal and Kolkata. The examination dates were 02/11/2014, 09/11/2014, 16/11/2014, 23/11/2014, 30/11/2014 and 01/02/2015 & 15/02/2015 (Re-Exams). It has been seen that the examination was taken on every Sundays through the month November, 2014. The recruitment notice related to this examination is E.N. No 0113 of 2013. Candidates applied for various post like Gateman, Truckman, Safaiwala, Khalashi, Driver, Porter, Mali, Peon, Cook, Helper etc. Every year a massive candidate apply for Railway Group D Post. Candidates who have appeared in the OMR Based Written Examination are eagerly waiting for the result. The recruitment process of Eastern Railway Group D Recruitment is :: Application > Appear Written Exam > Qualify > Physical Efficiency Test/Physical Measurement Test > Qualify > Medical Test > Pannel/Selection. So, anyone who will qualify in the OMR Based Written Examination should be prepared for appearing PET/PMT. The venue Information for PMT/PET will be provided in RRCER's Official Website. After Qualifying in the PMT/PET Candidates have to undergo a Medical Test and the venue information for Medical Check-up will also be found on the website www.rrcer.com so it will be better if you check the website frequently for Updates. The result of Written Examination for RRCER Group D recruitment has been published on 28/06/2015. How to Check RRCER Group D Result ? 3) !!! Control Number Not Required - Just Put Roll No and Submit. 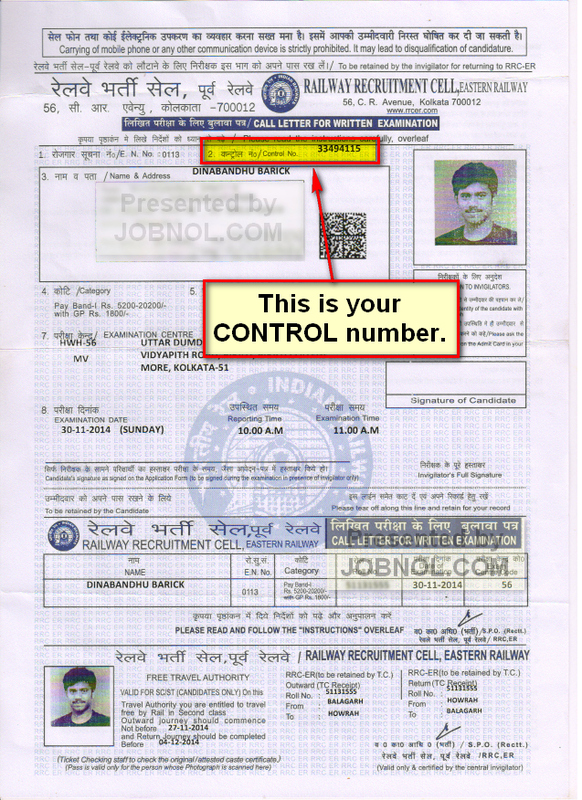 You will find your roll no and control number on your RRCER Admit Card. 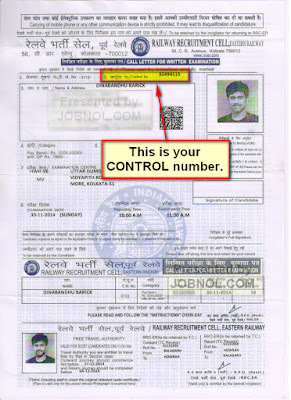 See Sample Admit Card for Details. RRCER & Result checking websites may delayed responding due massive traffic that is why you are requested to try after sometime. 0 Comment to " RRCER PET Venue & Result for Group D Recruitment E.N. No 0113 Eastern Region Kolkata "